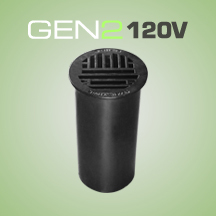 The Genesis Gen2 line of LED Lanscape Bullets are the most versatile LED fixtures on the market today. Various beam spreads and wattages allow for a customized finish to any property. The high end residential grade system was designed for 120V operation residential applcations. The die cast aluminum heat sink has 24 heat dissipating fins to maintain a cool operating LED for maximum life. The fins are independently supported to allow for unobstructed airflow. A cast brass junction box is provided for incoming power. A cathodic epoxy electrocoat primer or E-Coat is applied to all die cast aluminum components. E-coating provides the ultimate in corrosion and chemical resistance, providing superior salt spray, humidity and cyclic corrosion endurance. After the E-Coat is applied a super durable polyester powder coat finish is electrostatically applied in our state of the art paint facility. Techlight’s proprietary OpticapSystem™ utilizes interchangeable optical lenses & reflectors to increase fixture lumen output efficiency. The system is provided with a high performance convex lenticular prismatic flood or a plano-convex spot optical lens. The flood & spot optical lenses are molded from low iron tempered glass. A 96% reflective UV stabilized injection molded reflector is included with each system. A variety of glass color filters are available to meet the designers specific color control needs. The aluminum, brass, or composite safety grill rotates 360° for glare control. Fixtures are designed to be in-ground well lights and should be installed according to the installation instructions made available by Techlight. Proper drainage and substrate must be provided for water to flow freely through the well sleeve. A brass junction box is provided with an IP68 water-tight connector. Techlight warrants the LED lighting Product(s) to be free from defects in material and workmanship for a period of three years for LED Light Engines and LED Power Components, from the date of shipment. Ground mounted products that are provided standard with our proprietary E-Coat pretreatment prior to the application of a powdercoat finish will carry a full 10 year finish warranty. Proper maintenance is required for full finish warranty.